In a recent ATV accident, a local woman was flown via MedFlight to Boston hospital after her ATV crashed in a rural area off Main Street in Cotuit. According to the Cape Cod Times, the accident happened as the driver was riding along power lines near Santuit-Newtown Road. Our Cotuit personal injury attorneysknow ATVs are common in the New England area. They’re fun and they’re cost effective. Unfortunately, they can also be very dangerous. Some of these vehicles can travel at speeds up to 60 mph and can weigh up to 1,000 pounds. Because a lot of ATV crashes involve high speeds and rollovers, many of these crashes result in serious damage — and even death. But they’re not only cause by speed. 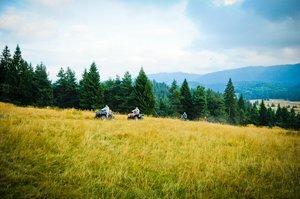 Some of the most common causes of ATV accidents also include driving on a paved surface (ATVs are designed for off-road handle), riding with too many passengers (most are designed for one rider), driver inexperience, riding without the proper supervision, performing dangerous stunts, operating in unfamiliar areas and for failing to observe state laws and local ordinances. It’s critical to keep an eye on our younger users. A new national report on ATV accidents shows a 150 percent increase in injuries to children under the age of 18 between 1997 and 2006. Hospitalizations for moderate to severe brain injuries tripled. About 42 of every 100,000 kids riding ATVs end up with a visit to the ER. -All riders are required to wear a helmet. -All ATVs are required to be registered, unless they’re being operated on the owner’s land. -No one under the age of 14 is allowed to operate an ATV. – Using an ATV on a paved road or a public ways is not allowed, except to cross the roads. -No one can operate an ATV that does not have a headlight on between sunset and sunrise. In the state of Massachusetts, there have been more than 70 ATV fatalities reported from 1982 to 2011. Close to 20 of the fatalities recorded from 1982 to 2007 were of children who were under the age of 16, according to ATVSafety.gov. -Close to 30% with injuries to the head or neck. -About 30 percent with injuries to the arms or hands. -More than 20 percent with injuries to the torso. -About 20 percent with injuries to the legs and feet. Before you head out on your next outdoor adventure, consider taking a hands-on training course. Even if you’re an experienced rider, you can never be too good. Professional teachers know how to control an ATV in specific situations. Their knowledge can help you. You also always want to make sure that you’re wearing the proper protective gear — especially a helmet. Many ATV injuries are head injuries. Never allow a child under 16 drive or ride an adult ATV. Lastly, and just like operating a passenger vehicle, you never want to operate an ATV under the influence of alcohol or drugs. These substances can alter your reaction abilities and your judgment — two skills that are critical in safe riding. If you or someone you love has been injured in an ATV accident, contact Boston Accident Lawyer Jeffrey S. Glassman for a free and confidential appointment to discuss your rights. Call 877-617-5333.